One of our dear clients, Megan Dumaine, (getting married this upcoming summer!) just so happens to be the owner of a fabulous little bridal boutique in Watertown, named The Wedding Embassy! This upcoming Sunday, March 1st, Megan and the Wedding Embassy are hosting a bridal gown sample sale and wedding showcase in conjuction with the Palace Theater in Waterbury. We are thrilled for Megan, she has put an incredible amount of work into ensuring that this event is a smashing success! This sample sale features a huge selection of the area’s most gorgeous gowns, courtesy of The Wedding Embassy, Ragtime Boutique, Joyce’s Bridal, Delianne’s Bridal and Formal Wear, and The Great White Way, that range in price from $99 to $999. The first 50 brides receive 10% off their purchase! The Wedding Showcase also features an array of CT's best bakeries, photographers, DJ’s and caterers, who will be on hand to offer patrons mini-samplings of their finest products. Attendees will receive a special gift and complimentary breakfast, and can enter a raffle to win a variety of prizes, including a tiara fit for a princess. The event starts at 8:00 am, the entrance cost is $5 dollars per person. The first 50 brides receive entrance free of charge! We will be there and we hope you will be too! It was two years ago this week that Lindsay and I met Claudia and Scott for the very first time. Claudia had so many ideas, so much excitement, and naturally a few nerves that go along with a wedding of over 300 on the guest list. Scott was so sweet, you could tell within five minutes just how dearly he loved her, how much he wanted for her to have the assistance she was seeking, and of course, he had plenty of ideas of his own as well. As with most of our clients, the wedding vision narrowed and took shape over time, but from the moment we sat down, Claudia dreamed in Purple and Silver, Dazzle and Bling. Other ideas came and went, but these ideas remained. Within two months of planning, we worked with Claudia and Scott as they selected their venue, their photographer, their DJ, and their florist, as well as Claudia's hair and make-up team! They were so ready to get the planning underway. For their wedding reception they choose The Villa Rosa, a spot that was near and dear to their hearts as Claudia's mother has worked there for many years. The staff at the Villa Rosa wanted nothing more than for Claudia and Scott's wedding to be absolutely flawless. We knew right away that Jerome Braga of Studio 1923 would do an incredible job capturing their day. As soon as they met him, they knew as well! All pictures in this post are courtesy of Studio 1923. When I arrived at Claudia's parent's house on that blustery morning, the excitement was intoxicating. The house was full of girls having hair and make-up done by Naomi Martinez and Angela Dubreuil of Salon Naomi. Everyone looked beautiful, Claudia's dramatic look was incredible. To assist in bringing her vision to life Claudia chose a stunner, a sweetheart necklined and trumpet skirted gown made by designer 2be Bride. The detailed beadwork and embroidery drazzled of Swarovski Crystal and Freshwater Pearl. Not only was the dress an excellent selection to match the theme, but it fit Claudia like a glove, ah, bridal perfection! Her girls wore dresses by Watters and Bill Levkoff and Claudia worked with shoreline jewelry designer Lisa Giard, owner of Ooo la la Jewelry to custom create their necklace and earring sets. The floral design by Jane at Just For You was gorgeous all around. Claudia's bouquet was a classic beauty, rich and full with various shades of purple, pink and cream, calla lillies, orchids, roses, seeded eucalyptus and loose greens. The ceremony was held in Waterbury Connecticut at the Basilica of the Immaculate Conception. Claudia and Scott had fallen in love with the orante and grand space, I couldn't think of a more dramatic space to hold their wedding ceremony. Claudia's bridesmaid Angela sang the most beautiful rendition of Ave Maria during the ceremony. It was incredibly moving, touching and personal. Following the ceremony, guests were greeted at the Villa Rosa to a ballroom, crisp and clean. Smartly dressed tables and chairs in white, with lavender accents and sophisticated tall arrangements of calla lillies and curly willow. Claudia's mother Carmela was one of the sweetest of moms we have worked with. She put so much thought and pride into choosing the little details and personalizing touches one being the guest favors. Each couple received a stained glass hurricane vase, neatly wrapped and polished with a bow on the tables. The cake, provided by Cakes by Donna was a four tiered staggered confection, wrapped with rich eggplant ribbon, dressed in fondant and adorned with roses and delicate greens. Not to be without a little glitz and glamour, Claudia had ordered a Swarovski crystal cake topper in lavender and amethyst to signify their new married initials. To get the party started, Claudia and Scott surprised their attendants with Pom Poms to wave as the newlyweds were called to the ballroom. The spirit this group had was merely a glimpse into the good times that would follow as the evening progressed. Claudia and Scott enlisted the DJ services of the Ken Reeder Experience. They had seen him play at a wedding of a friend, loved his upbeat, involved and entertaining persona, and it was clear early on, that their guests would enjoy him as well. Following their grand entrance, Claudia and Scott danced to Hideaway, by Tess Ann Chin. I absolutely love when couples choose something unique, and all eyes were on them as the enjoyed their special moment. During the dinner course, the live mariachi ensemble from Michael Entertainment arrived to wow the crowd. They mingled and played, guests took to them right away, dancing with them, wearing their hats, it was quite the hit, they were fantastic. We couldn't help but take breather and get a rave picture of ourselves as dinner was just wrapping up. Jerome joined us and one of Claudia's friends took the picture! As the evening roared on, so did the party, the dance floor was jumping, Claudia and Scott kicked up their heals to the music with all of their friends and family. Claudia and Scott, we hope you had as much fun planning your wedding as we had planning it along side of you. You both are incredible people with so much love, we wish you endless happiness together. 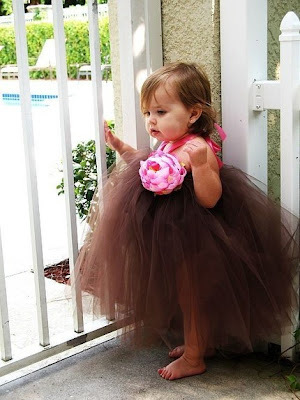 A girly, girl at heart, I confess to having a full out obsession with tutus. Seriously, they are tulle done right. Or, it can be a bit more rockstar, as seen in this amazing video by Monachetti of D.C., Swoon. For this reason, I was so excited to see Layla Grayce's 20% off sale on their Ruffles and Frills collection through this Friday. Promotion code is TWIRL.